All CPU Meter is a most popular and most wanted gadget in our website and also in Microsoft desktop gadgets gallery. 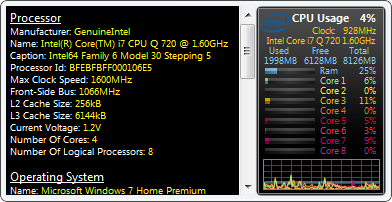 All CPU Meter will show your processor usage (up to 24 cores), Ram usage, CPU Frequency, name of processor (Intel or AMD). For flyout features it will show you many of info include processor, operating system, base board, bios and computer system. For the RAM (Random Access Memory) it can display your used, free, total usage in MB (megabyte) and also total usage in bar and percentage. For the graph it can display all core of processor usage and RAM usage by drawing style in line or filled. Qweas is providing links to All CPU Meter 3.9 as a courtesy, and makes no representations regarding All CPU Meter or any other applications or any information related thereto. Any questions, complaints or claims regarding this application All CPU Meter 3.9 must be directed to the appropriate software vendor. You may click the publisher link of All CPU Meter on the top of this page to get more details about the vendor.